I promised to report back on the latest ongoing project, i.e. temperature measurement in-situ transmission electron microscopy (TEM). At our lab we usually do a lot of in-situ TEM experiment with special types of sample holders that have a movable probe. The probe is used to contact and characterize nanomaterials and in these experiments most often electrical current is used to probe and heat up the sample. However measurements of the actual temperature induced by this electrical heating is problematic in these types of two-probe setup. We know the input electrical power and can model and estimate the temperature based on this. But dissipation of heating energy in contact resistances make this a rather uncertain method. A direct temperature method would be most useful and by introducing a optical fiber into the system, this is possible for higher temperatures, i.e. above 1000 Kelvin, by measuring the blackbody spectra. Temperature measurements, due to by black-body radiation. Cathodoluminescence, induced by the electron beam of the TEM. Laser input, for heating or stimulation of the sample being tested. TERS, or tip enhanced raman spectroscopy. Special fiber for inlett of various types of gases inside the TEM for example. As mention before, we use special types of sample holders. That is modified versions of the Nanofactory Instruments AB, se figure 4, holders. Because these holders already have electrical wiring to control the probe in front of the holder they are easily modified to fit more wiring or as in this case an optical fiber. This project was driven as a two student projet at bachelor university level in which the students modified the holder with the insertion of an optical fiber during a period of ten weeks. Great thanks to these two good students of the Mid Sweden University. The most obvious problem is how to get the optical fiber inside the vacuum system of the TEM without introducing a leak. We chose to build our solution on an optical fiber patch cord 200um of VIS/NIR type from Edmund Optics. This saved us time as we did not need to assemble the optical SMA contacts that the spectrometer uses. Most technical details can be seen in the drawing shown below, figure 1, so here I only write some supporting information. The patch cord is held in place by fitting and squeezing an O-ring tight around the cord with a screw metal plate clamping, se figure 2. This to avoid unwanted tension in the accutal fiber that goes through the sample holder. Figure 1 (top), the schematic drawing of the modified sample holder with an optical fiber. Figure 2 (left), The backside of the sample holder, here one can se the screw clamping of the fiber patch cord at the top. Figure 3 (right), the front of the sample holder, here one can se the moving probe (right) used for contacting and heating nano materials. At the top one can se the optical fiber, here with light coming out in the end of it. In front of the fiber is placed a 45 degree angle rod mirror coated with aluminum this to direct the black body radiation from the sample (center of image, oposite to the probe) into the fiber. Figure 4 (bottom), the sample holder in hole. The front to the left and the modified backside of the holder to the right in image. This holder is used in a JEOL-2000fx transmission electron microscope. The fiber patch cord is unwrapped and the fiber is left exposed at the front of the clamping position. Here the fiber is threaded through a rubber-plug and this plug is fixated in a tapered hole, this gives a high vacuum tight seal, some Fomblin grease was used to make things slide more easily. By the way remember that if you instead have an ultra high vacuum system, rubber is not allowed. After the plug the fiber is continuing towards into the front of the sample holder. To assemble this a fishing line was used and threaded from the oposite direction and glued to the top of the fiber to help threading and guiding the fiber through the holder. The fiber is threaded through and comes out in the front of the sample holder at the side of the probe, se figure 3 and cut with a tweezer-cutter to proper length. First we thought that some fixation device was needed to hold the fiber in place but since the 200um optical fiber is quit stiff this was not needed. We also did not notice any problems with charging due to the e-beam exposure of the fiber. 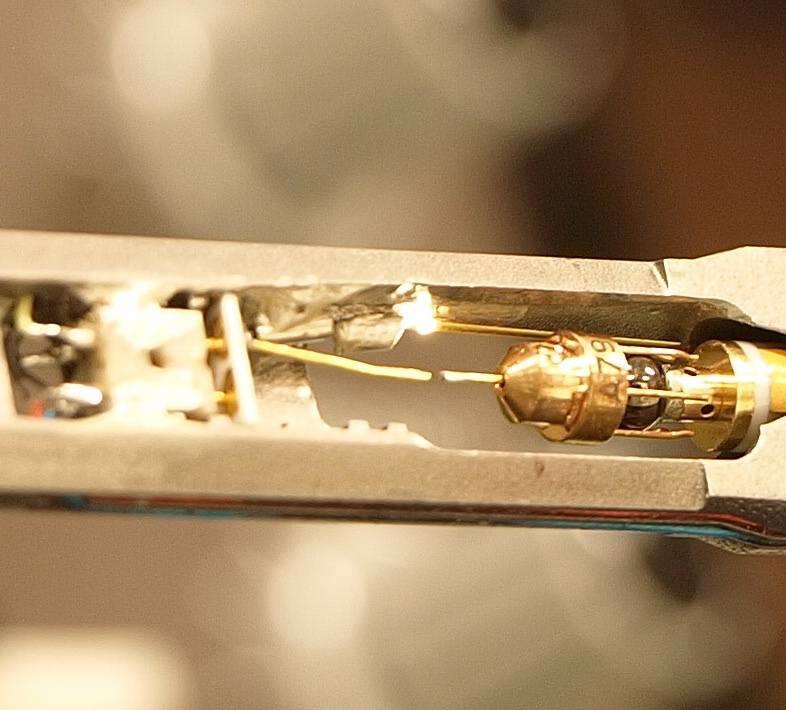 To direct the light produced by the heated sample into the fiber a mirror was used. We bought a rod mirror of diameter 1mm from Edmund Optics for this purpose, it is aluminum coated so charging by the e-beam would be less problematic. We also bought a prism but did not use this for the same reason that the beam might charge this uncoated prism, se figure 5. The mirror was glued with electrical conductive glue onto a Pt/Ir stiff wire that was fitted into a metall tube that was in-turn glued to the side of the holder and at the front of the fiber, this to allow for proper adjustment of the mirror so that the radiation from the sample could be directed into the fiber, se figure 3. Light was led through the fiber in the oposite direction, i.e. from the spectrometer side, to make proper alignment of the fiber-mirror-sample system. Figure 5, rod mirror with aluminum coating and a diameter of 1mm (left) and the prism that was not used due to believed electric beam charging (right). We used a previously bought spectrometer from Edmund Optics for the first tests, it is a relabeled BWTEK CCD-spectrometer of VIS-NIR type. It has sensitivity up to 1000nm wavelength. The sensitivity drops almost linearly from 500nm to 1000nm by 75% which is of course quit bad for blackbody experiments which has it's peaks around 1000nm, but it did well for a first test result as seen figure 6. What we did was to heat up, by driving an electrical current through, a sample of Mo6S3I6 nanowires. The sensitivity was not enough to record the blackbody radiation intensity from a single nanowire bundle but only when severals was heated at the same time. The spectrometer gives a curve that resembles quit well a curve from previously measured well defined temperature source of 1300 Kelvin (furnace) so the conclusion is that the samples was heated to the same temperature, se figure 6. Figure 6 (left), spectrometer data of the first in-situ TEM experiments when a Mo6S3I6 nanowire sample is heated up to 1300 Kelvin, as proven by the calibration curve from a furnace test. Figure 7 (right) CNT 's heated up to almost 2800 Kelvin, compared to a tungsten lamp source spectra, the lamp spectra is somewhat flooded in the detector counts at its peak. If you know some blackbody radiation, se wikipedia for example, theory you know that the peak of the radiation spectra would be 1000nm for a tungsten lamp at 2800 Kelvin and the peak in our diagram above was found at a shorter wavelength thus indicating an even higher temperature than this. Of course this is not the case thus the observed peak is due to the spectrometers dropping sensitivity for increasing wavelength, one can correct this curve to a known temperature source so it shows the real blackbody curve, however this is not shown as this beyond the topic of this blog post. We also tried heating up carbon nanotubes, here also with severals at the same time but here we achieved a must higher temperature of almost 2800 Kelvin as seen if one compares the data with a tungsten lamp source at 2800 Kelvin, se figure 7. Due to the higher temperature the blackbody intensity is increased dramatically which is beneficial for the detector. Previously we used the maximum integration time of the spectrometer, that is 60s, but here we could lower this to 10s and yet still, half of the maximum count of the detector was achieved. The method of using an optical fiber patch cord to introduce in-situ temperature measurements in the TEM worked. Blackbody radiation intensity was recorded for a Mo6S3I6 sample heated to a temperature of 1300 Kelvin as well as a carbon nano tube sample heated to 2800 Kelvin. The used spectrometer was not optimum, a better chice would have been a Prime X spectrometer or a Sol 1.7 spectrometer from BWTEK which has a better sensitivity in the range of 800nm to 1200nm. Higher wavelength sensitivity will probably not be needed as blackbody spectra in these wavelength would be of to weak intensity anyway. Currently we are working on making the hole system of this in-situ TEM probing mobile by utilizing a PXI-measurement system from National Instruments. Very interesting and pioneering work. Hope to see the publication very soon.